This week is Brain Injury Awareness Week. More than 500,000 Australians have an acquired brain injury, so what can we do reduce the numbers? In this blog post, NeuRA’s Professor Lynne Bilston explains that prevention is key in cutting the numbers of those affected each year. Traumatic brain injury occurs when an impact to the head causes damage to the brain tissue. It’s very common – about 2500 serious brain injuries occur each year in Australia, and many more that are less serious. Even apparently minor injuries often have ongoing effects on people’s lives, and repeated minor trauma can predispose people to dementia later in life. Brain injury has enormous social and financial costs, profoundly affecting the lives of not only those with the brain injury but also their families. The lifetime cost of looking after people who acquire a brain injury in Australia in a typical year is estimated to be approximately $8.6 billion[i], much of that cost falls on individuals and families, not just on our health system. Improvements in emergency care after trauma have helped more people survive, but there are no drug treatments that make significant differences in function once a traumatic brain injury happens. Rehabilitation is a long and arduous road, with often only small improvements resulting. Prevention of traumatic brain injury is therefore paramount. To prevent brain injuries, we must understand how they happen and from there, design effective prevention strategies, whether these are engineering design solutions such as improvements to car safety features and restraints, public education programs, or clearer regulations. These methods all help. Research done together with my colleague Dr Julie Brown into injuries in car crashes – the leading cause of brain injury, details how these injuries are sustained in crashes, and what factors contribute to brain injury. In children, we have shown that the most serious injuries can be prevented entirely if children are correctly strapped into the right type of child restraint for their size. This apparently simple approach works because the right restraint used properly stops the child’s head from hitting hard objects in a crash. If there’s no head impact, then the head can come to a stop relatively slowly. This minimises the acceleration forces on the head and prevents the brain from ‘sloshing around’ inside the skull, which in turn, dramatically reduces the risk of serious head injury. Our research has led to new national child restraint laws, which require children to use the right type of car seat for their age. But our research shows that the laws alone are not enough. 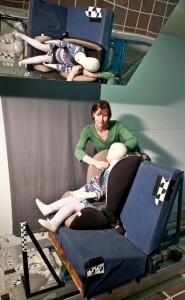 We must also help parents use the restraints correctly, otherwise they won’t work properly. We have shown that better restraint labels make it easier for parents to choose the right restraint for their child’s size. Getting restraints checked by a professional can also reduce mistakes in how they are used. We’ve shown that education programs in preschools can help kids understand how to use restraints correctly. The fact is, preventing brain injury is not only possible but vital, and needs the ongoing cooperation of neuroscientists, engineers, public health experts, teachers, and governments.